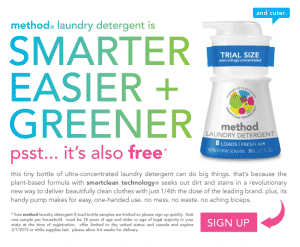 Click here to visit the Method laundry facebook and like them. Then on the “give it a spin” tab, click sign up. On the next page just fill out the form to request a free trial size bottle. According to their site, this one should arrive in 4-6 weeks. thanks I have been wanting to try this! after i filled out the form, hit submit, and it comes up, page not found. Says page not found .